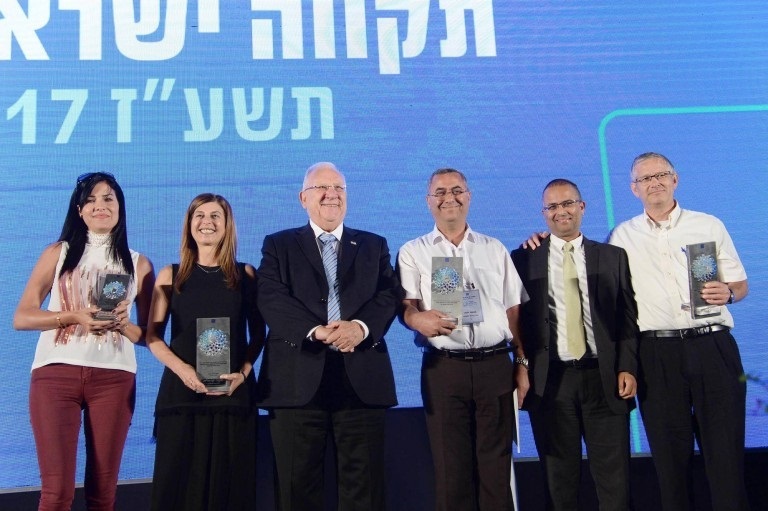 JERUSALEM, ISRAEL – Israel’s President, Reuven Rivlin, has presented the Israel Sci-Tech Hilmi Shaffi Comprehensive School, with the President’s Award for “Education Cooperation.” The school serves over 1,000 students from the Arab community in the multifaceted city of Akko (Acre). The award commends the Hilmi Shaffi School for extraordinary cooperation with local Jewish schools. Hangout for Peace: a collaboration between Israel Sci-Tech Schools, Google and the Peres Center for Peace connects students and fosters substantive relationships between Arabs and Jews through dialogue. By using Google+ Hangout as the communication platform, thousands of Israeli Arab and Jewish teenagers from different cultures, religions, and backgrounds are connected. The School’s Jewish Arab Teen Parliament allows its students to brainstorm and initiate projects for changes in both schools and in the city of Akko. Kaleidoscope helps students to develop social skills necessary for co-existence and acceptance of each other – which ISTSN considers one of their civic duties. The Israel Sci-Tech Schools Network provides students across the country with many similar programs where they explore crucial social issues. Friends of Israel Sci-Tech Schools is a U.S.-based 501-C3 dedicated to supporting over 200 institutions and close to 100,000 students that represent the largest independent network of science and technology educational institutions in Israel. Today, there are more than 550,000 alumni, many of whom have gone onto become senior leaders in the military, high tech entrepreneurs, as well as some of the top engineers and scientists in Israel.